Archaeological and Anthropological Sciences covers the full spectrum of natural scientific methods with an emphasis on the archaeological contexts and the questions being studied. It bridges the gap between archaeologists and natural scientists providing a forum to encourage the continued integration of scientific methodologies in archaeological research. Coverage in the journal includes: archaeology, geology/geophysical prospection, geoarchaeology, geochronology, palaeoanthropology, archaeozoology and archaeobotany, genetics and other biomolecules, material analysis and conservation science. 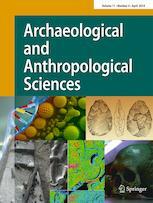 The journal is endorsed by the German Society of Natural Scientific Archaeology and Archaeometry (GNAA), the Hellenic Society for Archaeometry (HSC), the Association of Italian Archaeometrists (AIAr) and the Society of Archaeological Sciences (SAS).